What do I need to start? What if I cancel or forget about the lesson? How Long Does it take? Who are the instructors? What will the first lesson be like? Where can I get more info on what the laws of Washington State are? How often should I have lessons? What are your school policies? How often should I drive? What are your fees? Can I pass the test? What is IDL and how does it affect me? Does Cascade have "shortcuts" to skills? What do I need to apply for a permit and/or license? When are your classes? Do you offer a payment plan? Can Cascade pick me up and drop me off for lessons? Do you teach motorcycle riding? For more questions, please give us a call or send us an e-mail. We offer single lessons or lesson packages in multiples of 6 hours. You will need a Washington State instruction permit or International Driver's License. Some other documents are acceptable. Please contact the school before scheduling your first lesson. We need your 'license number' as established by the dol in order to electronically release your waiver thus allowing you to obtain a permit at the dol up to 10 days prior to the first day of your class!! This code is the same as your ID number or permit number. It is also known as your 'confirmation' number and your PIC (personal identification code). You can create the code at dol.wa.gov if you like, by choosing to "pre-apply." You must obtain your permit within one week of the start of class. You can go from being a novice to a competent driver with the Washington State required minimum of 50 hours of driving practice - some may need more practice. Those practice hours must be with a licensed driver who meets the following qualifications: at least 21 years of age, 5 years experience, licensed for at least 3 years, sitting next to you in a properly insured vehicle. What will the first lesson be like? We start where you feel comfortable. That may mean backing and turning in a parking lot. For most students it will mean more advanced lessons depending on your level of experience. You progress as skills develop and we reinforce them as you improve. We recommend three times a week for at least one hour and hopefully two. Lessons should be combined with practice. We can provide the practice but a good driver, licensed for 5 years or more can assist. How often should I drive? The best method is to drive daily. Frequent driving means the skills you develop are strengthened and don't weaken between drives. By driving often you will not have to relearn skills. Yes, The three keys to passing the Department of Licensing test (DOL) are: Practice, Practice, Practice! Does Cascade have "shortcuts" to skills? Yes, Our instructors are very experienced and their skills mean you will progress quickly. However these new skills need practice. Intelligence is not a substitute to building the experience and skills you need behind the wheel. Furthermore we are skilled experts on the rules of the road, defensive driving and the right skills in the car. By coming to us for lessons you get the correct answers given by highly experienced professional teachers. Monday, Tuesday and Wednesday from 5-7, 7-9 pm (Feb-Oct: 3-5) in Aberdeen. For more information, give us a call or send us an e-mail or see our register page. We offer behind the wheel appointments at a variety of times on an individual basis. Can Cascade pick me and drop me off for lessons? Adult drives only: Yes, we can pick you up at home or work. If you are close the the classrooms we do not have a charge for this service. If you are further out we have a time and travel charge of $25.00 hr. What if I cancel or forget about the lesson? Please cancel at least 24 hours in advance. Lessons not canceled in a timely manner are subject to a $25.00 missed lesson fee. Our instructors pass a rigorous training and testing program and are certified by the DOL. They each pass an FBI background check. How can I find out more information on what the laws of Washington State are? You can always e-mail us with any of your questions or check out the Washington State Licensing web site at www.wa.gov/dol/maintext.htm. You can also research RCW Title 46. What are your school policies? Driving is an adult responsibility. Student conduct is expected to be positive and non-disruptive. 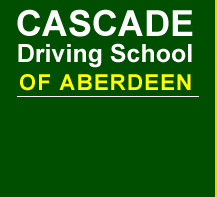 Unless specifically noted with the individual student, driving lessons will usually begin and end at Cascade Driving School of Aberdeen. Students must sign-in when class begins. Those leaving without authority of the instructor will not be credited with attendance for that period. Students who miss more than 3 sessions are subject to being dropped. Students who do not complete the class with-in 12 weeks are subject to being dropped. They must then pay a restart fee to re-enroll. Students must obtain a satisfactory competency. The 6 hours of driving we provide are lessons, practice is needed to secure proficiency. Students unable to practice at home may obtain extra drives at $50.00 an hour. We have a $25.00 fee for missed appointment without at least 24 hour notice. No refund will be given after the first session, or receipt of waiver form - whichever comes first. Please see our register page. Full Payment is due at the start of the first class. What is an IDL and how does it affect me? Must have, from a licensed driver with at least 5 years experience, 50 hours supervised of driving practice (10 hours at night). Must have a permit for 6 months prior to applying for a license. No traffic violations with-in 6 months prior to applying for a license. No drug or alcohol offense(s). Drivers must complete driver's education. Parent or guardian notification for infractions and suspension on further infractions. What do I need to apply for a permit and/or license? Providing a social security number is mandatory for all license applications. A certificate of completion of Traffic Safety Education (TSE) is generally required for license applicants under 18. Parent or Guardian permission is required for anyone under the age of 18. A vision, knowledge, and skill test is required for all first time drivers. We accept Cash, Checks, Visa, MasterCard, American Express and Discover. We do offer payment plans. Full payment is due by the end of the class. Call for details. No, we prefer to concentrate on automobile classes. Snow Day School Closures ? School will not be conducted or drives given if due to weather Aberdeen School District (or local district for branch schools) closes for the day or releases early.